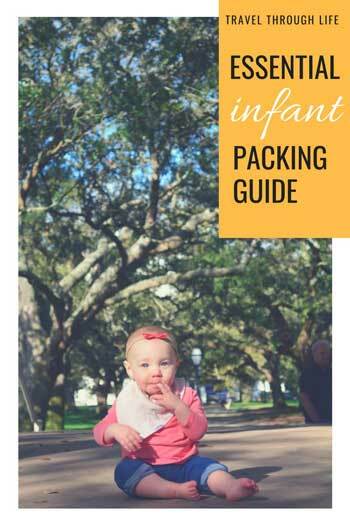 We’ve created our very own baby travel packing list for infants and want to share it with you. Because when you’re traveling with an infant (0 to 6 months), you probably think you’ll need a million things. But really, you don’t and we’ll show you the things you really need for an adventure with your little one. 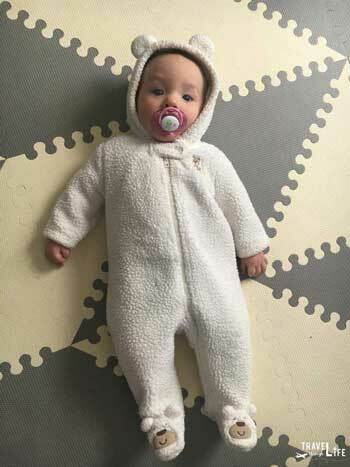 Baby clothes are so cute and should always make your holiday checklist. But one thing we’ve learned is that one minute, the kid fits in them, and she’s too big the next. 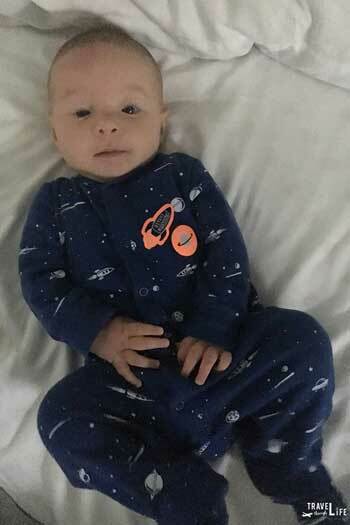 Of course, don’t forget cute pajamas to keep your kid warm and adorable through the night! 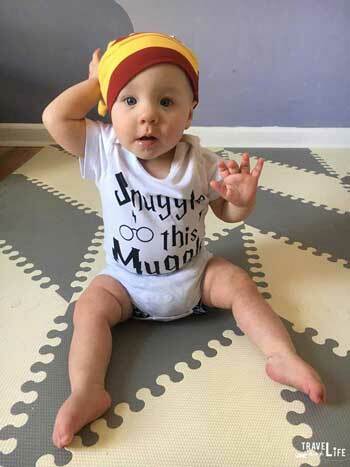 Find the most snugglable clothes for infants here! At home, we cloth diaper. This was a choice we made as a family that happened to be right for us. When we started traveling with our little one, we found it incredibly hard to keep up with. Not only were we keeping all of the diapers once they were dirty, but also the extra bulk in the diaper bag while we were hopping around museums and parks became hard to manage. So when we travel, we use disposables. For both cloth diapers and disposables, we also bring along a Wet/Dry Bag in case we need to change at a place without a trash can. We also use this in our hotel rooms just as a courtesy to the cleaning staff. Maybe we’re too nice? Check for best pricing on diapers for your infant! Your challenge: To clean this face with one wipe! Wet wipes are lifesavers and these wipes are free of added fragrances, alcohol, and other stuff that’s not too good for you or the earth. 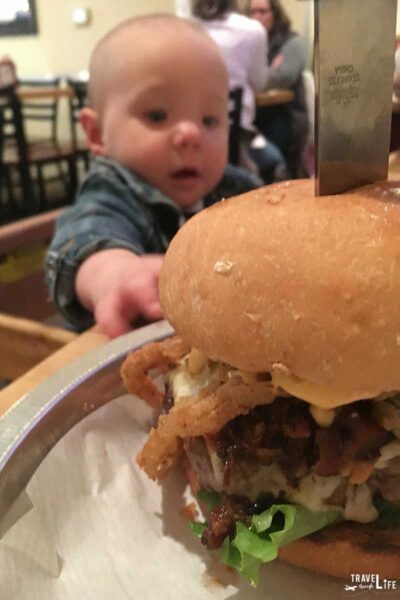 Wipes for the baby, the momma, the restaurant floor. Wipes are amazing for every part of life! Search for more of the best wet wipes for you and your family! 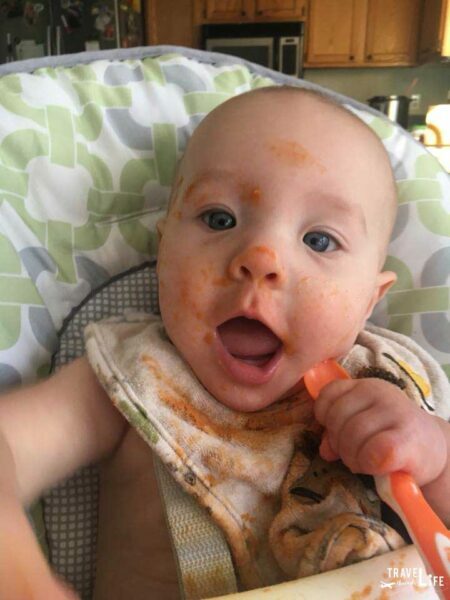 A burp cloth is essential during the first dozen or so months, especially after feeding. Drool bibs come in handy when teething begins. Both are great when we need to quickly clean up a mess. 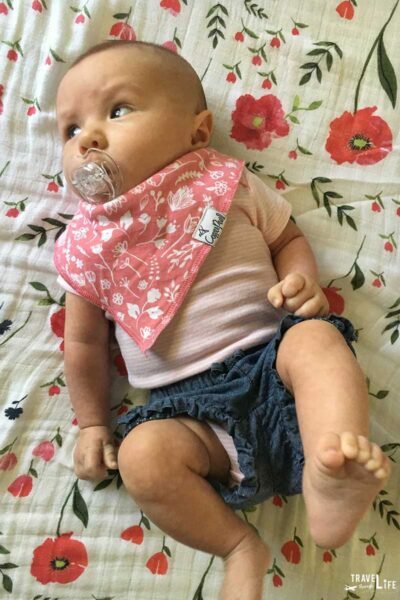 Find more burp cloths and drool bibs that fit your little one! Pacifiers are like socks in a dryer, as I feel like our child has a secret stash of them somewhere. These BPA-free ones by Philips are Charlotte’s favorite, though it could vary for you. We also recommend bringing a clip that attaches to the baby’s clothes, so you have a better chance of not losing your paci! 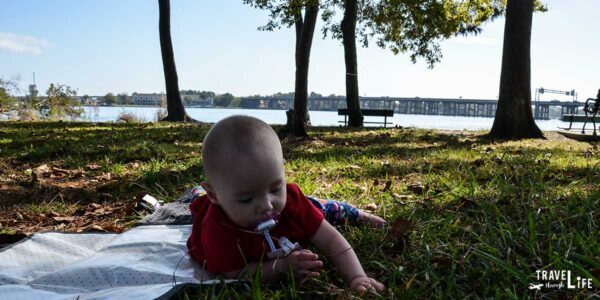 Find the pacifier that’s the best fit for your baby! We like naming our child’s toys, even if there’s already something established. 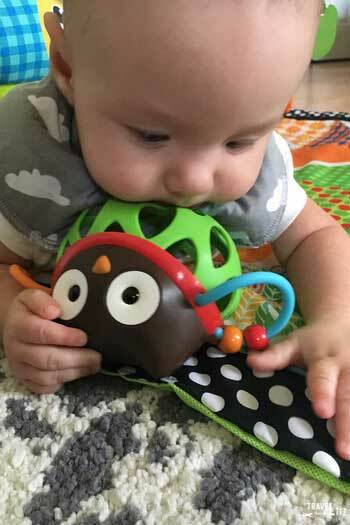 Rickon Stark here (We named most toys after TV show and book characters, btw) is great for developmental play, has a fun-sounding rattle, and cute eyes that light up our daughter’s face every time. When traveling, I really find that having a lot of toys aren’t really necessary. We always bring one toy (like Rickon) that we know will light her up when she’s upset, but otherwise, she’s usually checking out all the sights! Toys are where I think a lot of parents can lighten the load, because more than likely you’re going to be on the go and they won’t really miss them! 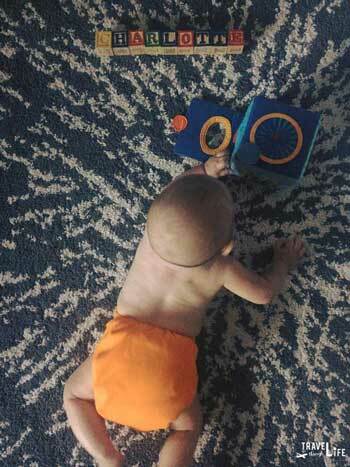 Find more fun toys like ours to help keep your infant entertained during the trip! Having a carrier like this is great for hiking with a baby but also walks through areas where a stroller might not work. Think crowded areas or places with minimal space. A comfortable baby carrier is KEY for traveling with an infant. Not only is important to have a space for baby to sleep on the go, but having it comfortable for the parent is also really important! We’ve tried out a lot of carriers, and the Ergo is by far the best. 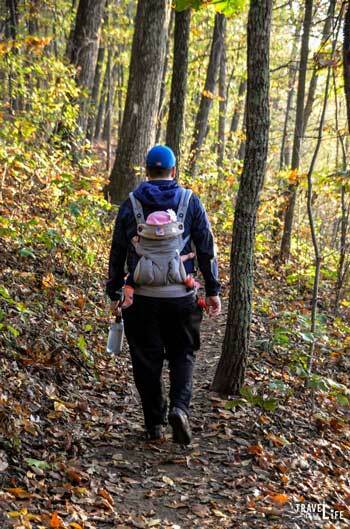 Check out our list of baby hiking gear beyond the carrier and you’ll find the Ergo, along with more! We tested a few different strollers and found ours. However, we also learned that it was a case of what worked for us maybe not working for everyone. Because we don’t have a huge car, we can’t take the jogging stroller on trips because of the huge wheel. We’ve test-ridden some that double as a car seat, which might work for you, too! 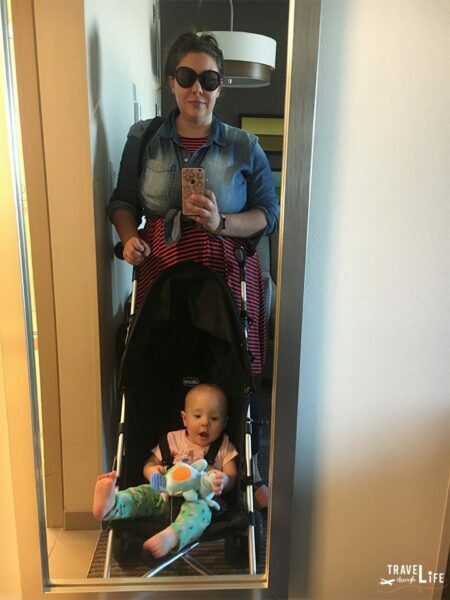 We’ve loved this small light-weight travel stroller forever and continued using it even as our little one got older! For chilly days and breezes, it’s nice to have a blanket handy. That way, we can tuck the little one in and keep her nice and warm when out. Really, anything with some thickness will do. 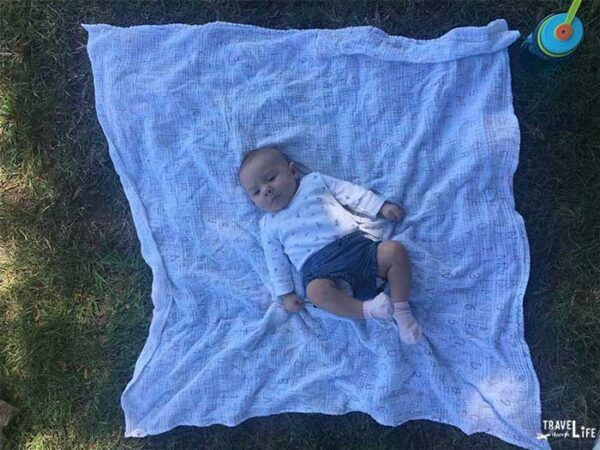 Find the best baby blankets that will keep your little one warm and comfy! This was a nice thing to have when Charlotte was really young. 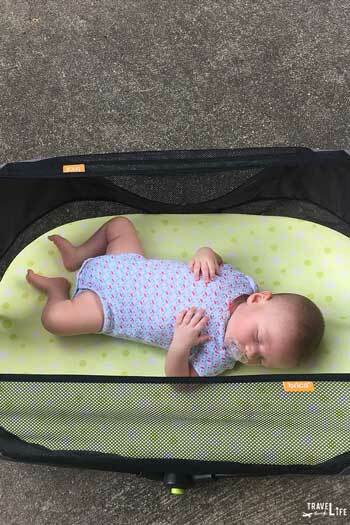 Having a travel bassinet was great easy sleep on the go as well as hanging out in unfamiliar terrain. We love this bassinet so much that we included it in our Four-Gift Christmas Challenge for Travelers! Some people pack a Travel Highchair but we’ve been finding more and more places already have one on hand. Still, you might want to bring one along if you the highchairs on hand are too short for the table, which we’ve found to be the case. The best travel highchairs are just a click away! We’re definitely not perfect and there have been quite a few times when we’ve forgotten things. Here’s the way we look at it: as long as we have diapers, the baby, and each other, everything will work out. 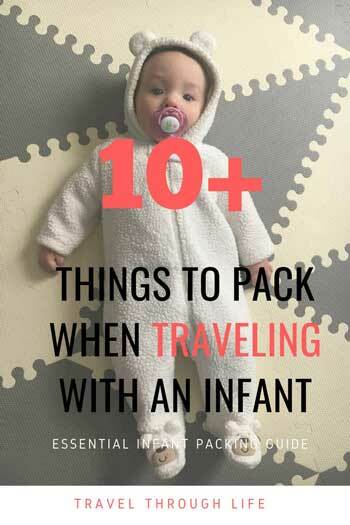 As long as we follow this baby travel packing list, we know what the kid needs and we can then worry about what to pack for ourselves. 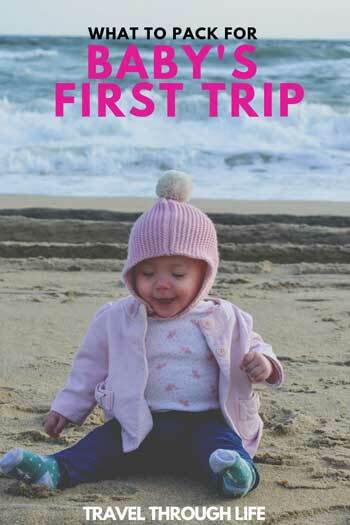 This is part of our series on baby travel, where we’ve covered journeys with our little one from the beginning, through older baby stages, and beyond. It’s also part of our broader section on travel with kids. If you’d like to see more of how we travel with baby in tow, please let us know! We’re always open to new ideas.